How Do Students Collect Donations? On Friday, February 15, 2019, we will be hosting St. Mary’s Annual Walk-A-Thon. The walk-a-thon is a fundraiser where all students have the opportunity to get some exercise and have some fun walking with their classmates in the fresh air while helping to raise money for our school. The event will include music, refreshments, prizes and lots and lots of jelly bands! Friends, parents, and teachers will be on hand to cheer on the kids. Our goal this year is to raise $10,000 which is a BIG number, but by working together we can achieve anything! In fact, if each student could meet the challenge of raising $50 each in donations, we would more than surpass that goal! Note that since we organize this event ourselves, 100% of all proceeds will go directly to our school. Click HERE to see how we are doing so far! Or, students can share a web link by which family and friends can donate online. By creating a unique participant link, students will get a unique web URL that they can share via email and through social media. Any donations that originate from that link will be automatically credited to that student’s fundraising goal. And the more money a student raises, the better chance the student will have to win an Awesome Prize! In addition to knowing that 100% of the proceeds will go directly to our school and benefit us all, we’ve setup a variety of prizes and incentives to help inspire students to collect walk-a-thon sponsors and donations. 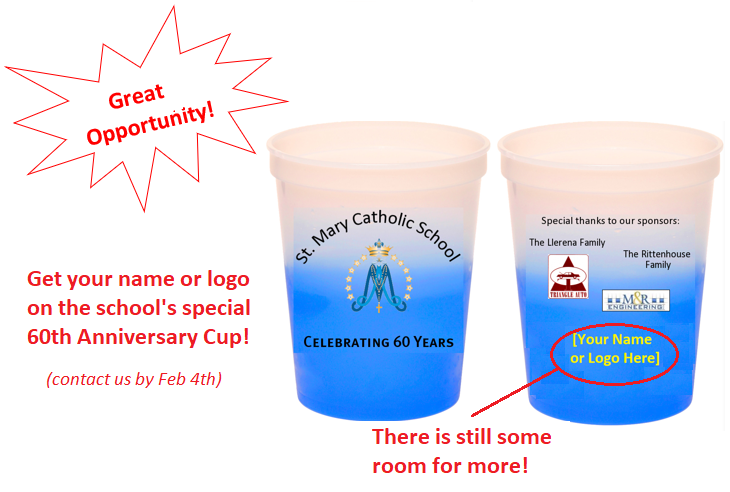 Back By Popular Demand: ALL students that participate at all will get a St. Mary Catholic School color-changing cup!!! ALL students that raise at least $10 will get a Nut Day Pass. – MORE PRIZES TO BE ANNOUNCED SOON! Note that the sooner students meet the $50 challenge; the sooner they will get entered into ALL the weekly drawings and the better chance they have to win! Pizza Party! – The class that raises the most money in donations will get a Pizza Party! Ice Cream Party – The class that raises the second-most money in donations will get an Ice Cream Party! 2018 Class Competition Champions – Mrs. Mangieri’s 3rd Grade raised $1926! See which classes are currently in the lead HERE. The Teacher Challenge will be back! Join us at walk-a-thon halftime for this annual crazy & fun teacher competition. Please consider signing up to help run water stations, pass out jelly bands or various other volunteer positions. Sign up HERE. We have various sponsorship opportunities available that are mutually beneficial to both businesses and our school. Please click HERE to see the various sponsorship opportunities that are available. The Merheb Family and M&R Engineering, Inc. Please keep the donations and sponsorships coming! Together, we can make this important fundraiser a success! Thank you! How do I collect in-person donations? You can collect cash or checks made payable to “St. Mary’s School”. Please turn in all collected donations to the office BEFORE February 15, 2019. To ensure the donations are recorded toward your walk-a-thon donation total, please include the Walk-A-Thon Pledge Form when turning money in by hand. Can I collect online donations? Yes! Be sure to create a unique participant link at: https://www.uburst.com/cgi-bin/uwalk/accounts/stmarysschool/uwalk.pl Upon creating a participant link, you can share that link via email and through social media. Any donations that originate from that link will be automatically credited to that student’s fundraising goal. And the more money a student raises, the better chance the student will have to win an Awesome Prize! How do I see how much in donations I have? If you registered on the Participants page, then you can re-visit the Participants page and request your donation report to be emailed to you as often as you like. It’s automated. Are Prizes Guaranteed? So the short answer is “no”, prizes are not guaranteed… except for the nut-day passes that all students who bring in at least $10 in donations will receive. That said, the more money you bring in the better chance you will have to win a prize. For example, suppose the walk-a-thon raises $10,000. If a student brings in $500 in donations, that student will have 500 chances out of 10,000 to win a prize. If a student brings in $100 in donations, that student will have 100 chances out of 10,000 to win a prize. And remember, we have multiple prizes being given away each week… so it’s not just one pick each week… there are multiple prize winners being picked every week. See also Prizes and Incentives! for more details about prizes.